In a special feature to mark the imminent reopening of the much-loved Settle and Carlisle route to through trains following last February’s landslip and the completion of Network Rail’s £23 million repair programme, Brian Sharpe and Robin Jones look at a dozen of the best lineside locations to capture the much-anticipated return of steam action. March 31 will see what many people regard as a dream steam excursion. Among the unusual steam workings to have been seen on the S&C was the run from Falkirk to Rainhill by the Scottish Railway Preservation Society’s NBR J36 0-6-0 No. 673 Maude and two Caledonian Railway coaches. 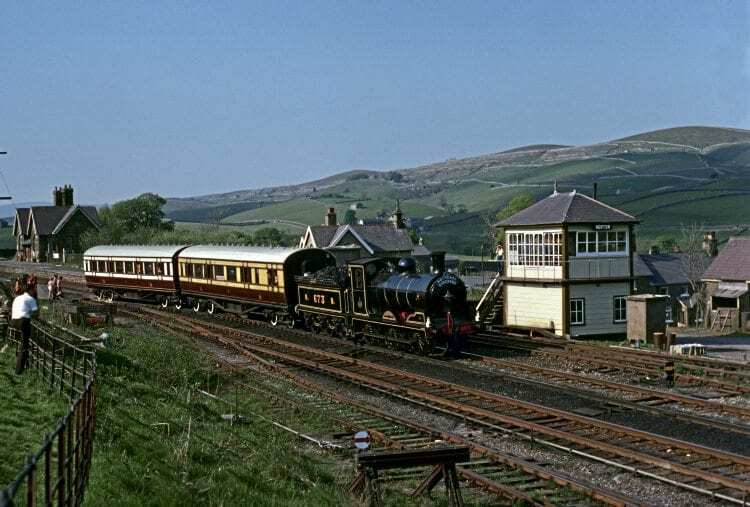 The 0-6-0 passes Horton-in-Ribblesdale on May 17, 1980. Flying Scotsman no less, will haul a special train over the entire 73 miles of one of the most beautiful main line railways in Europe, the Settle and Carlisle line. As highlighted in Main Line News, pages 56-61, the trip from Oxenhope to Carlisle is being run by the Keighley & Worth Valley Railway, in conjunction with Northern, Network Rail and the Friends of the Settle & Carlisle and will be operated by West Coast Railways. It will be the precursor to many, many more steam trips over this stunning trans-Pennine route, notably the ‘Fellsman’ and ‘Statesman’ excursions, following its repair reopening by Network Rail after being out of action for nearly 14 months. The reopening of the line throughout, which vies with the Dawlish sea wall route and the West Highland Line for drama, will undoubtedly bring visitors flocking back in droves, not only to ride on the trains and savour some of the north country’s most stunning upland scenery from the elevated comfort of a carriage, but to photograph trains in action from the lineside. This is the route that was so nearly lost three decades ago, only to be saved by people power in the form of nationwide protests. Indeed, it is a line that might never have come into existence, but for the often-petty rivalries of railway companies in the Victorian age. Plans for the Settle and Carlisle line were drawn up by the Midland Railway as the culmination of a long-running dispute with the LNWR over access to Scotland. The Midland’s trains ran to Scotland via the ‘Little North Western’ route to Ingleton and Lowgill, where it joined the Lancaster & Carlisle Railway, which was operated by the LNWR.